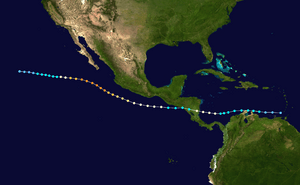 Hurricane Cesar-Douglas was a Category 4 hurricane that crossed the Atlantic as Hurricane Cesar. The storm continue to move west to the Pacific as Hurricane Douglas. The storm was the strongest storm for the 1996 Pacific hurricane season. 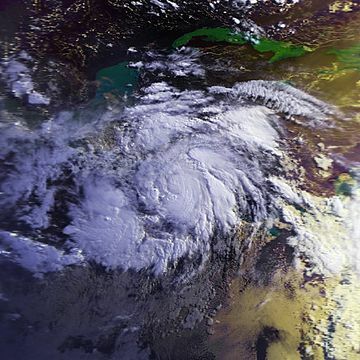 It was the second hurricane of the 1996 Atlantic hurricane season, in the Atlantic it was a category 1. The start of this storm goes back to a tropical wave near Dakar, Senegal. It crossed the Atlantic and did not start until it was close to the Windward Islands. On July 24 it became Tropical Depression Three. Tropical Depression Three became Tropical Storm Cesar on July 25. Cesar did not strengthen much because it was close to land. It did start to strengthen more as it entered the Southwestern Caribbean Sea. After about half way between Nicaragua and South America, Tropical Storm Cesar became a hurricane on July 27. Hurricane Cesar reached its highest winds on July 28, which were at 85 mph. Later that day, Hurricane Cesar made landfall near Bluefields, in Nicaragua while it still had its highest winds. Cesar weakened into a tropical storm over Central America. But it did survive crossing Central America. 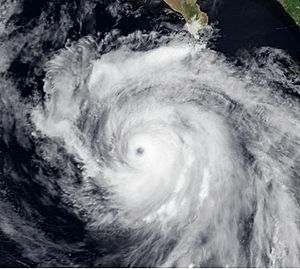 Late on July 28, Cesar reached the Pacific Ocean and was renamed Tropical Storm Douglas. By the next day, Tropical Storm Douglas became a hurricane. Later, on August 1, Hurricane Douglas reached its highest wind, which were at 130 mph. Douglas started getting weaker because of cooler waters. On August 5, Hurricane Douglas died. The name "Cesas" was retired and the name "Douglas" was not retired. In 2002 and 2008 the name Cristobal was used instead, it was not retired. For the Pacific, the name "Douglas" used in 2002 and 2008, it still wasn't retired. Hurricane Cesar-Douglas Facts for Kids. Kiddle Encyclopedia.